A discriminatory phrase was found last week in a bathroom stall located at the Lecture Halls 150 & 151 building on the campus of Cal State Long Beach. The image above has been censored for viewers. 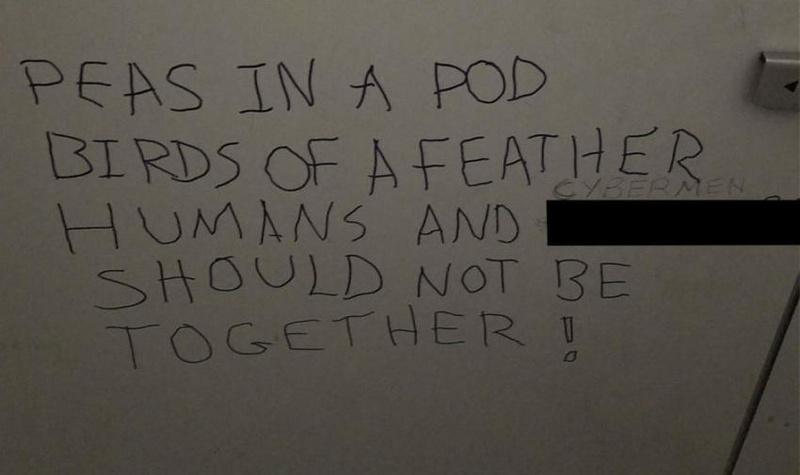 A racist message was found on the wall in a bathroom at Cal State Long Beach, last week, targeting black students. The language was so offensive that university president Jane Close Conoley emailed the entire campus to vigorously condemn it. But it's not the first incident of its kind at CSULB this year. Or the second. Or even third. "Students of color probably do feel threatened on our campus right about now," says Miranda Andrade-Ceja, editor in chief of the school's newspaper, the Daily 49er. Last month, members of the Latino/Latina student organization La Raza were sent death threats on Facebook. And earlier this year, there were several incidents of fliers plastered around campus bearing swastikas and anti-Semitic phrases. "A lot of it has to do with our current political and social climate," Andrade-Ceja says. "We're kind of dealing with outside sources or anonymous sources threatening or making our students feel threatened." Hear about the kind of atmosphere recent racist incidents are creating on the Cal State Long Beach campus. Use the blue audio player above.